The Andes is South America's longest mountain range, forming a continuous chain of highland along the western coast of South America. It is over 4,400 miles (7,000 km) long, 200 miles (300 km) wide throughout its length (except in the Bolivian flexure where it is 640 km wide) with an average height of about 13,000 feet (4,000 m). The Andes is the highest mountain range outside Asia, with the highest peak, Aconcagua, rising to 22,834 feet (6,960 m) above sea level. The summit of Mount Chimborazo in the Ecuadorean Andes is the point on the Earth's surface most distant from its center, because of the equatorial bulge. 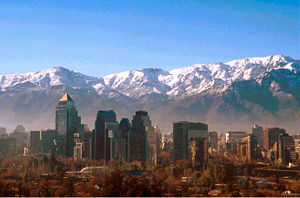 The name Andes comes from the Quechua word anti, which means "high crest." Another theory says that the name Andes derived from the Spanish word "anden" which means terrace in reference to the cultivation terraces used by the Incas and other related peoples. 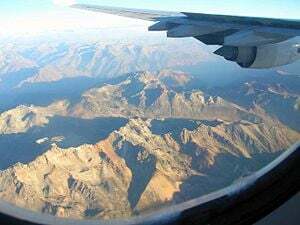 Plane's view of the Andes, Peru. The famed ruins of the ancient city of Machu Picchu are in the Andean slopes of Peru. The Andes Mountains extend over seven countries: Argentina, Bolivia, Chile, Colombia, Ecuador, Peru, and Venezuela, some of which are known as Andean States. The islands of Aruba, Bonaire, and Curaçao, which lie in the Caribbean Sea off the coast of Venezuela, represent the submerged peaks of the extreme northern edge of the Andes range. They are not a single line of peaks, but instead a succession of parallel and transverse mountain ranges. Rift valley near Quilotoa, Ecuador. The Andes can be divided into three sections: the Southern Andes in Argentina and Chile; the Central Andes, including the Chilean and Peruvian cordilleras (from the Spanish word meaning "rope"); and the northern section in Venezuela, Colombia, and northern Ecuador consisting of two parallel ranges, the Cordillera Occidental and the Cordillera Oriental. These ranges are often separated by a deep intermediate depressions. Other small chains arise on the sides of the great chains. 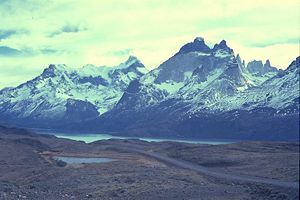 The Cordillera de la Costa starts from the southern extremity of the continent and runs in a northerly direction, parallel with the coast, being broken up at its beginning into a number of islands and afterwards forming the western boundary of the great central valley of Chile. To the north this coastal chain continues in small ridges or isolated hills along the Pacific Ocean as far as Venezuela, always leaving the same valley more or less visible to the west of the western great chain. The Andes fundamentally are the result of plate tectonics processes, caused by the subduction of the Nazca plate beneath the South American plate. The boundary between the two plates is marked by the Peru-Chile oceanic trench. The descending Nazca plate is a young and buoyant lithosphere, which resists subduction, causing many earthquakes. The formation of the Andes began in the Jurassic period, but it was during the Cretaceous Period that the Andes began to take their present form, by the uplifting, faulting and folding of sedimentary and metamorphic rocks of the ancient cratons to the east. Tectonic forces along the subduction zone along the entire west coast of South America where the Nazca Plate and a part of the Antarctic Plate are sliding beneath the South American Plate continue to produce an ongoing orogenic event resulting in minor to major earthquakes and volcanic eruptions. In the extreme south, a major transform fault separates Tierra del Fuego from the small Scotia Plate. Across the 600 mile (1,000 km) wide Drake Passage lie the mountains of the Antarctic Peninsula south of the Scotia Plate which appear to be a continuation of the Andes chain. The Andes range has many active volcanoes, including Cotopaxi, one of the highest active volcanoes in the world. The climate in the Andes varies greatly depending on location, altitude, and proximity to the sea. The southern section is rainy and cool, the central Andes are dry with large variations in temperature. The northern Andes are typically rainy and warm. The climate is known to change drastically. Tropical rainforests exist just miles away from the snow covered peak, Cotopaxi. The mountains have a large effect on the temperatures of nearby areas. The snow line depends on the location. It is at between 4,500–4,800 m in the tropical Ecuadorian, Colombian, Venezuelan, and northern Peruvian Andes, rising to 4,800–5,200 m in the drier mountains of southern Peru south to northern Chile south to about 30°S, then descending to 4,500 m on Aconcagua at 32°S, 2,000 m at 40°S, 500 m at 50°S, and only 300 m in Tierra del Fuego at 55°S; from 50°S, several of the larger glaciers descend to sea level. The llama can be found living at high altitudes, predominantly in the Peru and Bolivia. The alpaca, a type of llama, is raised for its wool. The nocturnal chinchilla, an endangered member of the rodent order, inhabits the Andes' alpine regions. The South American condor is the largest bird of its kind in the Western hemisphere. Other animals include the huemul, cougar, camelids and, for birds, the partridge, parina, huallata, and coot. Llamas and cougars play important roles in many Andean cultures. 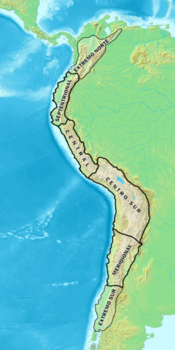 The Inca Civilization developed in the northern Andes during the 1400s. The Incas formed this civilization through careful and meticulous governmental management. The government sponsored the construction of aqueducts and roads, some of which, like those created by the Romans, are still in existence today. The aqueducts turned the previously scattered Incan tribe into the agricultural and eventually militaristic masters of the region. Devastated by deadly European diseases to which they had no immunity, the Incas were conquered by an army of 180 men led by Pizarro in 1532. One of the few Inca cities the Spanish never found in their conquest was Machu Picchu, which lay hidden on a peak on the edge of the Andes where they descend to the Amazon. 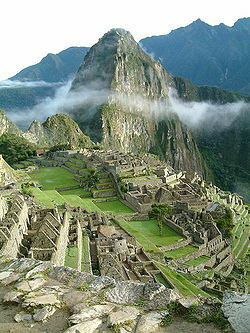 Machu Picchu (sometimes called the "Lost City of the Incas") is one of the most well known sites of the Inca Empire. The ruin, located high in the Andes Mountains, is one of the most important archaeological centers in South America, and as a consequence, the most visited tourist attraction in Peru. This UNESCO World Heritage Site remains an incredible combination of natural beauty and human creativity. Map showing cultural influence in the Andes. The ancient peoples of the Andes have practiced irrigation techniques for over 6,000 years. Because of the mountain slopes, terracing has been a common practice. Maize and barley were important crops for these people. Currently, tobacco, cotton, and coffee are the main export crops. The potato holds a very important role as an internally consumed crop. By far the most important plant in terms of history and culture is cocoa, the leaves of which have been central to the Andean people for centuries. Coca has been a staple dietary supplement and cornerstone to Andean culture throughout much of its history. Unprocessed coca leaves are commonly used in the Andean countries to make an herbal tea with mild stimulant effects similar to strong coffee, but is best known in most of the world for the stimulant drug cocaine that is chemically extracted from its new fresh leaf tips in a similar fashion to tea bush harvesting. Mining is quite prosperous in the Andes, with iron, gold, silver, and copper being the main production minerals. 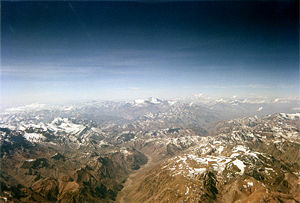 The Andes are reputed to be one of the most important sources of these minerals in the world. The people of the Andes are not well connected to urban regions. Due to the arduous terrain, vehicles are of little use. People generally walk to their destinations, using the llama as their primary pack animal. The main surviving languages of the Andean peoples are those of the Quechua and Aymara language families. ↑ Climate of the Andes, Blue Planet Biomes. Retrieved October 27, 2007. All links retrieved March 20, 2016. This page was last modified on 20 March 2016, at 18:58.